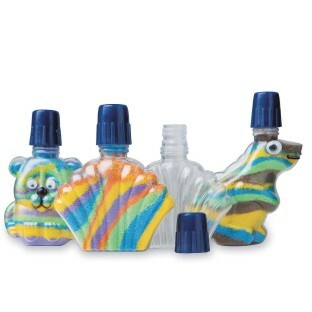 Fill with colorful sand or glitter for a beautiful effect! Assorted plastic bottles measure 1-1/2"-2". Make multi-colored layered sand art in these fun shapes bottles! 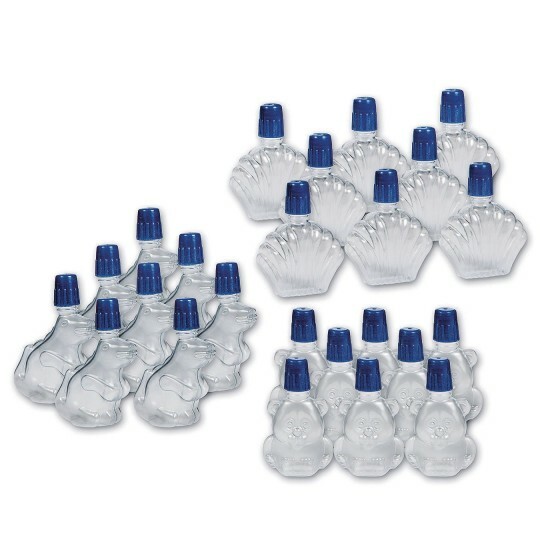 Pack of 24 assorted plastic bottles measure 1-1/2” to 2” with navy blue screw caps. Requires 2 lbs. of sand to fill all 24 bottles. Sand and decorating supplies sold separately. They are ok for the price. A couple of them were broken and they aren't made if too high of quality but for the really little kids at the Art Fair they were ok. These are very small but cute. The funnels I had are too big to fit into the opening which makes it difficult to pour sand into. They aren't the easiest to use. There is a nice variation to the shapes of the bottles. Too small for my sand art business but fun for the kids at home.